Citrix Endpoint Management provides mobile device management (MDM) and mobile application management (MAM), as well as enterprise productivity apps, in a single, comprehensive solution. Citrix Endpoint Management enhances the ease-of-use of bring-your-own (BYO) or corporate endpoints without sacrificing security. Unified Endpoint Management (UEM) represents the evolution of Mobile Device Management (MDM). This modern management platform removes the complications that come with a disconnected set of device management tools and platforms. With Citrix Endpoint Management UEM, you can inventory, manage and secure a broad range of device types with a single management console. As corporate device programs, such as BYOD, mobility management platforms have become critical building blocks which extend the reach and visibility of IT across all endpoints. Moving beyond iOS and Android, Citrix UEM provides management and controls for Windows 10, MacOS, Chrome, thin clients and Workspace Hub device types, using XenMobile as its foundation. XenMobile provides mobile application management (MAM) options so your organization can select the mobile app management strategy that is best suited to meet your security and privacy requirements. Protect application data either by leveraging device and platform security or by taking the XenMobile MAM-only approach, which requires no device enrollment. The Citrix Endpoint Management MAM-only approach is ideal for BYOD situations where user privacy prohibits the use of an MDM client or device enrollment and management. Citrix ShareFile integrates with Citrix Endpoint Management, enabling employees to access, synchronize and securely share files across virtually any device, and with people inside and outside the organization. Offline access maintains productivity even when users are on the move. IT retains control over data that can be stored together in the corporate network, in the cloud, or both. 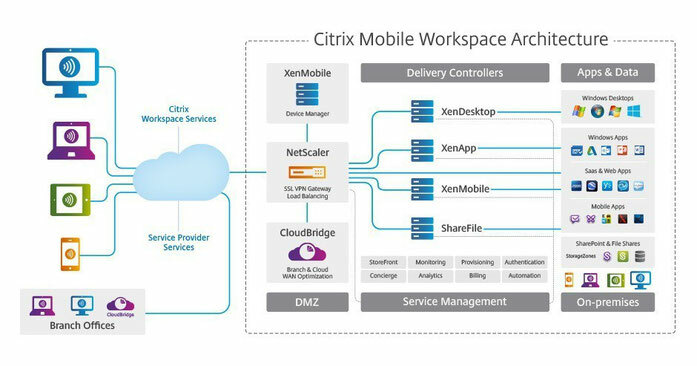 The Citrix Worx App SDK protects mobile apps with Citrix Endpoint Management. Explore the apps in the Worx Apps Gallery - the industry's richest set of enterprise-class apps. ISEC7 Mobility for SAP is of course Worx App ready. Talk to our XenMobile experts now!